From my experience, it is the people that make the job. By surrounding yourself with good people, they can make the most mundane of jobs fun and meaningful. 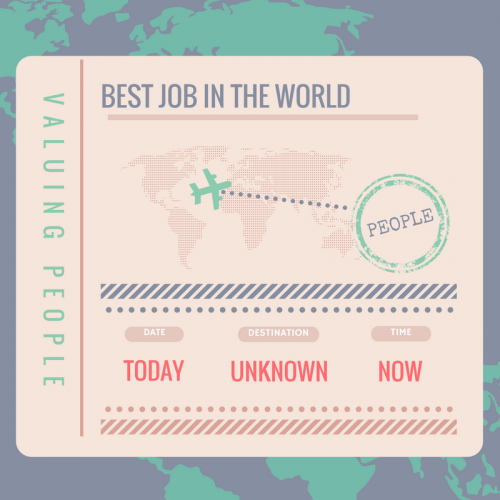 So, to have the best job in the world, you need to work for and with the best people. Here at VP Forensic we are all about the people, in case you missed it, our name stands for Valuing People. The secret about valuing people is that all people are important. In the fast-paced, corporate and media frenzied world that we live in, it can be difficult to show how we value one another. In the office, this can be as simple as making a cup of tea or asking ‘Can I help’? At home, this is washing your pots and giving your loved ones a hug before you leave. As a company, we ask – how do our employees know that they are valued members of the company? From day one of their recruitment we are honest about the role they are applying for, what the recruitment process consists of and whether we think they are right for the position. This is where I come in. I am a Recruitment Administrator, in addition to the administration, it is my responsibility to resource, screen and recruit new people to become our Support Workers & Qualified Nurses. After receiving a suitable application form or CV from a person, I give them a call. It is always better to put a voice to a name. Listening to someone’s voice brings them to life, no longer are they a name on a page or screen. There are a living, breathing person. The candidate gives me a snapshot of their personality. Are they loud? Are they funny? Are they relaxed? But most importantly in our line of work, Do they care? From this conversation, I decide if they will be invited to interview. The interviewers are not only looking for specific knowledge, competency and experience, they try and get a feel for the person too. Our support workers and qualified nurses represent our company, they are the face our clients see each day. We are a company that recruits only the best with a focus on people talking to people. The person-centred approach is not only found in the recruitment process, it is throughout the entire company. When you are an active member of staff, we are in regular contact with available shifts, to check up on ID, holidays or even just for a good catch up. If an incident occurs on a unit (which can happen in mental health care) we are in your corner, ensuring that our staff are treated fairly. We want to know when you have a “big life moment” and when you need extra support. So, are VP Forensic the best company in the world? Personally, I know that when I come to work I am surrounded by people who will make me laugh, encourage me, understand that I have a life outside of work, support and help when I am struggling, push me to do better. For me, these are the best traits that people can have. Here’s the secret, when you surround yourself with such people, you begin to cultivate these same traits. You can become one of the best versions of yourself. Why don’t you see if you feel the same, apply today and start feeling valued.